J.M. 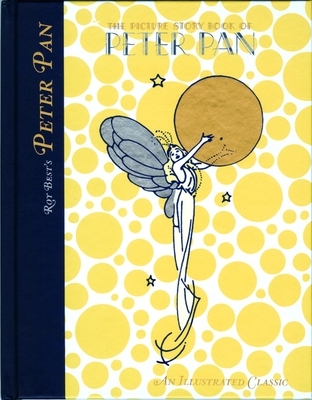 Barrie's 1904 play Peter Pan and Wendy (and its subsequent variations) about the adventures of a boy who won't grow up and his adventures with Tinker Bell and the Darling children has challenged and delighted illustrators for over a century. Every major children's illustrator seems to have done a version of it, and when one considers the visual possibilities of the story - children flying over London, crocodiles, pirates, mermaids, and a Newfoundland dog as a nanny - it's easy to see why. We have long wanted to publish this story, and in Roy Best's 1931 The Picture Story Book of Peter Pan we've found our Peter. It isn't often that and illustrator can sustain emotional and visual impact through nearly 100 pages, but Best manages it. These illustrations, though over 80 years old, seem preternaturally modern in their coloring and style. This Peter Pan is vibrant, more Disney than Arthur Rackham, but nothing is cheap or commercial. Barrie's tale is given its full due both visually and in the text, adapted from Barrie's play. Roy Best was an American artist best known his pin-up illustrations. Born in Ohio, Best attended the Art Institute of Chicago. In the 1920's he moved to New York City and found a career as illustrating for periodicals including The Saturday Evening Post. By the thirties Best began painting pin-ups and calendar art. In 1931 he published his best known book, The Peter Pan Picture Book. In the early forties, Best was hired by Brown and Bigelow; the publisher of Gil Elvgren, Norman Rockwell, Maxfield Parrish, Cassius Marcellus Coolidge (""Dogs Playing Poker"") and many other successful artists. He went on to a lucrative and successful career.